Like a Virgin garden roses are two-toned creamy light pink roses with hotpink accents on the edge of the outer petals. The Like a Virgin variety has a classic rose petal structure with loose, open and airy blooms and the most delicious garden rose fragrance. This rose will delight all your senses! Despite their two-toned colors, these roses are an overall light pink shade. 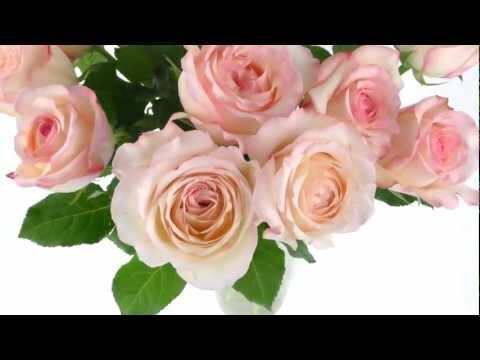 Garden rose flowers are a classic and elegant look for beautiful brides and make sophisticated wedding bouquets, boutonnieres or any arrangements. Now with Free Shipping! Length: Our Garden Roses range from 12-24 inches long. Garden Roses usually include one head per rose (ocasionally there will be one or even two additional side flower buds which may remain closed bud.). Garden Roses are usually packed in 12 stem bunches. Garden roses are known for their fragrance and their wild, far from uniform appearance. Diameter: These single stem garden roses are approx 2 to 2.5 inches in diameter when closed and approx 3 to 6 inches in diameter when fully opened.